Friend and sister(in-law) Ruth sent me a doll. Yeah! That means undoubtedly, I am excited for another opportunity to sign my book More Than a Ticket Memoirs Flying with American Airlines from Props to Jets at the Salt Lake International airport. WHERE: Terminal 1 After you go through Security and are walking to the escalator with all your luggage, I will try to stop you. Well, you do have a couple of hours, so before you board the escalator, I will be seated at a table in front of Weller Book Works. An important thing to know is that you need a ticket to get through Security. Yes, you will be going somewhere to enjoy time to sit and read a book. Serving for eight! Come on over for home-made ice cream. Joan and I were based in Los Angeles at the same time. I saw her name on the bid sheet. Did we fly together? Memory is a fleeting puzzle. Time has brought the crossing of our paths, if not in the air, certainly by mail. My new friend Joan is terrific. Time and space are intriguing and both have the power to change the wind, rain and friendships. aircraft from Los Angeles to Philadelphia in the fall of 1959, I was one of the stewardesses on board. It was an exciting event for the public as well as for the passengers and flight crew. 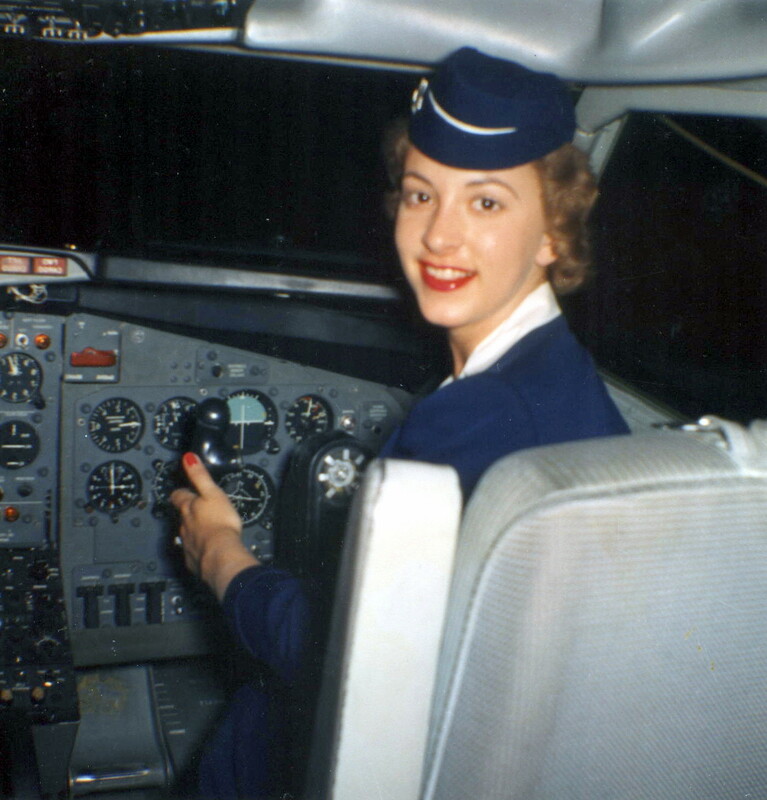 I felt honored to be one of only eight stewardesses who were awarded the schedule that included that flight. Having flown for only a few months, I did not have enough seniority to serve up front, so I wouldn't see any of the first class passengers during the flight. My only chance to see if any celebrities might be on board was to enter the plane through the passenger gate. The rest of the crew, as usual, avoided the passenger entrance or 'holding tank', as we called it, and went to the ramp directly from the crew lounge. This day, however, I headed for the passenger gate to see what kind of people would be flying on this big jet. I also liked the idea of being the first person they would let on board. the ticket taker for any news of no-shows. His foreign-accented grandmother hung onto him, looked out at the plane, and worriedly said "but dare are no propellers". He glanced at me (enviously, I thought) and seeing me in uniform, knew I would be getting on board, while he and his grandmother might not. I sadly looked back at those who would perhaps not make it. Soon we were on our way to the East Coast in less than four hours. We were met at our destination by yet another crowd which included the mayor of Philadelphia who gave each person, as they deplaned, a souvenir to remember their first jet flight . 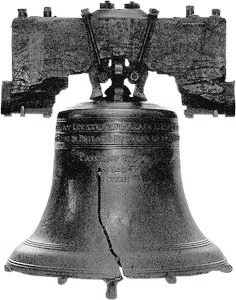 . . a small copper replica of the Liberty Bell. Twenty years later, that bell "tolled" a remarkable story. I met my dark, handsome husband on a skiing trip in Switzerland. He lived in San Francisco and I in Southern California. In 1979, after a year of 400 mile courting, I moved to the Bay area. As he helped me unpack, in my new house, he noticed the bell and asked me where it came from. When I told him, his eyes lit up in amazement as he replied "You were on that flight, twenty years ago? Unbelievable! I tried to get on that same plane for two weeks." Then he told me that his Russian-born grandmother and he were at the airport, in Los Angeles, that day, trying to fly standby to their home in Philadelphia. . . they made it on the next day's flight.Is there yet another story here, one I don't know how to tell? Is there a strange link, perhaps, between the envious glance of a sixteen year old boy at a twenty-two year old stewardess who is headed for a jet-ride he wants to be on, and an unconscious remembrance that attracts him to her twenty years later? Now, when anyone asks us how we know we were meant for each other, we answer: "Oh, it was jet fate." The book is filled with story after story! Enjoy!